You know how pretty much every time we tell you that a deal is a sell-out risk, it sells out soon after? Well guess what: this deal is a sell-out risk. A very, very big sell-out risk. 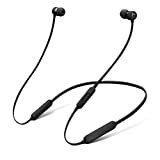 Amazon has been running a big sale on BeatsX Wireless In-Ear Headphones for a long time now, dropping the price to between $95 and $100 depending on color. Right now, however, the black BeatsX model is on sale for just $79.99. That’s right… $80 for brand new BeatsX earbuds with Apple’s W1 chip. There is no chance that these will still be in stock even a few hours from now, so you’d better hurry if you want a pair.